23 InnovativeHealthMag.com “reasonable,” and then the insurer only pays the discounted audited charge. That is one of the reasons why the insurance industry’s insistence on “fee schedules” is laughable. In actuality, the insurance industry has, perhaps, the most draconian fee schedule imaginable — the unilateral decision of its own auditors regarding what the insurance company should be required to pay! As a result of this practice, it is not uncommon for medical providers, who have not been fully paid, to terminate care to patients. All of this has created an unpredictable and disruptive reimbursement practice. Clearly, there is a place for medical bill auditing in the no-fault world. However, as with all other insurance practices that create a risk that a patient’s medical care could be interrupted, medical bill auditing needs to be regulated so that it is fair, reliable and predictable. MICHIGAN CATASTROPHIC CLAIMS ASSOCIATION (MCCA) CLAIM PRACTICE INTERFERENCE. 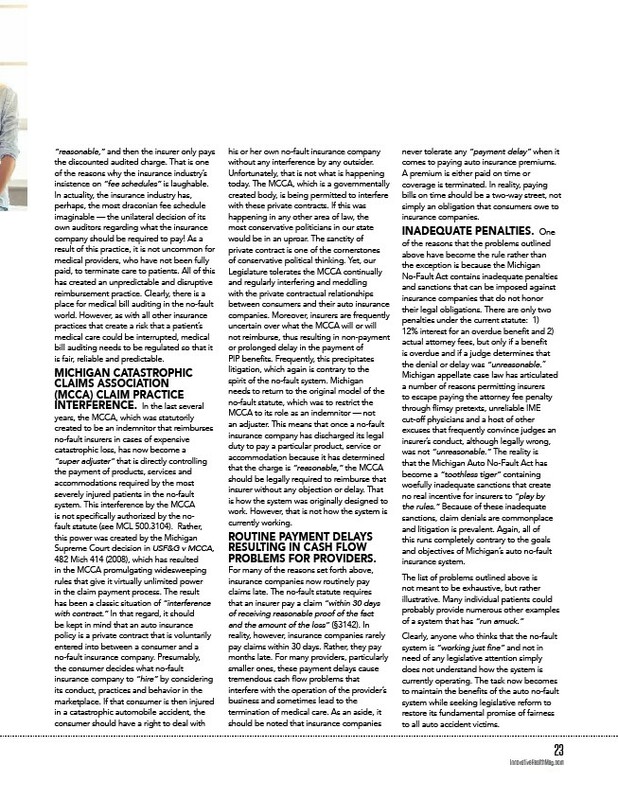 In the last several years, the MCCA, which was statutorily created to be an indemnitor that reimburses no-fault insurers in cases of expensive catastrophic loss, has now become a “super adjuster” that is directly controlling the payment of products, services and accommodations required by the most severely injured patients in the no-fault system. This interference by the MCCA is not specifically authorized by the nofault statute (see MCL 500.3104). Rather, this power was created by the Michigan Supreme Court decision in USF&G v MCCA, 482 Mich 414 (2008), which has resulted in the MCCA promulgating widesweeping rules that give it virtually unlimited power in the claim payment process. The result has been a classic situation of “interference with contract.” In that regard, it should be kept in mind that an auto insurance policy is a private contract that is voluntarily entered into between a consumer and a no-fault insurance company. Presumably, the consumer decides what no-fault insurance company to “hire” by considering its conduct, practices and behavior in the marketplace. If that consumer is then injured in a catastrophic automobile accident, the consumer should have a right to deal with his or her own no-fault insurance company without any interference by any outsider. Unfortunately, that is not what is happening today. The MCCA, which is a governmentally created body, is being permitted to interfere with these private contracts. If this was happening in any other area of law, the most conservative politicians in our state would be in an uproar. The sanctity of private contract is one of the cornerstones of conservative political thinking. Yet, our Legislature tolerates the MCCA continually and regularly interfering and meddling with the private contractual relationships between consumers and their auto insurance companies. Moreover, insurers are frequently uncertain over what the MCCA will or will not reimburse, thus resulting in non-payment or prolonged delay in the payment of PIP benefits. Frequently, this precipitates litigation, which again is contrary to the spirit of the no-fault system. Michigan needs to return to the original model of the no-fault statute, which was to restrict the MCCA to its role as an indemnitor — not an adjuster. This means that once a no-fault insurance company has discharged its legal duty to pay a particular product, service or accommodation because it has determined that the charge is “reasonable,” the MCCA should be legally required to reimburse that insurer without any objection or delay. That is how the system was originally designed to work. However, that is not how the system is currently working. ROUTINE PAYMENT DELAYS RESULTING IN CASH FLOW PROBLEMS FOR PROVIDERS. For many of the reasons set forth above, insurance companies now routinely pay claims late. The no-fault statute requires that an insurer pay a claim “within 30 days of receiving reasonable proof of the fact and the amount of the loss” (§3142). In reality, however, insurance companies rarely pay claims within 30 days. Rather, they pay months late. For many providers, particularly smaller ones, these payment delays cause tremendous cash flow problems that interfere with the operation of the provider’s business and sometimes lead to the termination of medical care. As an aside, it should be noted that insurance companies never tolerate any “payment delay” when it comes to paying auto insurance premiums. A premium is either paid on time or coverage is terminated. In reality, paying bills on time should be a two-way street, not simply an obligation that consumers owe to insurance companies. INADEQUATE PENALTIES. One of the reasons that the problems outlined above have become the rule rather than the exception is because the Michigan No-Fault Act contains inadequate penalties and sanctions that can be imposed against insurance companies that do not honor their legal obligations. There are only two penalties under the current statute: 1) 12% interest for an overdue benefit and 2) actual attorney fees, but only if a benefit is overdue and if a judge determines that the denial or delay was “unreasonable.” Michigan appellate case law has articulated a number of reasons permitting insurers to escape paying the attorney fee penalty through flimsy pretexts, unreliable IME cut-off physicians and a host of other excuses that frequently convince judges an insurer’s conduct, although legally wrong, was not “unreasonable.” The reality is that the Michigan Auto No-Fault Act has become a “toothless tiger” containing woefully inadequate sanctions that create no real incentive for insurers to “play by the rules.” Because of these inadequate sanctions, claim denials are commonplace and litigation is prevalent. Again, all of this runs completely contrary to the goals and objectives of Michigan’s auto no-fault insurance system. The list of problems outlined above is not meant to be exhaustive, but rather illustrative. Many individual patients could probably provide numerous other examples of a system that has “run amuck.” Clearly, anyone who thinks that the no-fault system is “working just fine” and not in need of any legislative attention simply does not understand how the system is currently operating. The task now becomes to maintain the benefits of the auto no-fault system while seeking legislative reform to restore its fundamental promise of fairness to all auto accident victims.